Amino acids are the building blocks of protein. Tyrosine is an amino acid that is essential for your body. It is needed for various functioning of the body. There are foods rich in tyrosine. Consuming these foods ensure that your body gets enough amounts of tyrosine. Tyrosine is one of the amino acid that is needed for the synthesis of proteins in the body. It is a non-essential amino acid. This means that your body has the ability to synthesise tyrosine on its own. This it does so by using another amino acid called phenylalanine. However, certain people who suffer from phenylketonuria, an inherited disorder, cannot process phenylalanine. So, they are unable to make tyrosine in their body. Such people will have to take tyrosine supplements. For others all that is needed is to consume foods rich in tyrosine and phenylalanine. This way you can provide the necessary amount of tyrosine needed for your body and keep important areas of the body nourished. Tyrosine is important for the normal functioning of dopamine and adrenalin. These are the brain chemicals. Both are essential for making us feel positive. Mustard greens are rich sources of tyrosine. A 200-calorie serving of mustard greens can provide you about 1580 mg of tyrosine. Beans and lentils contain high percentage of tyrosine in them. Make sure that you include lentils, kidney beans, split beans and chickpeas in your regular diet. You can also opt for whole grains like wild rice, millet, brown rice and oats. These are good sources of the amino acid. Cheese is the next top food after eggs that contain tyrosine. It contains about 1840 mg of tyrosine. The most popular cheese varieties that are rich in tyrosine are Swiss cheese, mozzarella cheese, Parmesan cheese, gruyere cheese and cottage cheese. Experts recommend the low fat varieties as the best. Eggs, as you know, are packed with vitamins. 200-calorie serving of eggs can provide you 1900 kg of tyrosine. We can consider a single egg containing 50gm of tyrosine. This means that you get 250 mg of tyrosine by consuming one egg. Along with eggs, milk and milk products also contain tyrosine. Fish is rich in various nutrients, including tyrosine. A 200-calorie serving of fish and salmon can provide you 1770 mg of tyrosine. So, consuming fish and salmon are good ways to keep your body healthy and for ensuring that all the systems are functioning properly. Both are great for improving brain chemicals and cognitive function. Other sea food high in tyrosine is tuna, shrimp, mackerel, crab and cod. Pork contains high amounts of tyrosine. A 200-calorie serving pork provides you 1600 mg of tyrosine. Consuming lean pork and beef is the best way to increase the levels of tyrosine in the body. Game meat, especially moose and elk, also contain this amino acid in high amounts. You can eat meat in various forms. Add it to the soups, cook it in gravy, roast it or bake it. Meat eaters get a lot of nutrients, but the vegetarians have to take care of the food they eat and ensure that they consume the right food to get the necessary nutrients. Nuts like almonds and peanuts are rich sources of tyrosine. 200-calorie serving of nuts like peanuts, walnuts, almonds and pecans contain high amounts of tyrosine. All you have to do is to add a handful of nuts to your daily diet. You can add them to your morning cereal or blend it with milk to make smoothie rich in tyrosine. Other nuts that can provide you good amounts of tyrosine are pine nuts, flaxseeds and pistachio nuts. Turkey and chicken are also rich sources of proteins. They contain high percentage of tyrosine in them. You get 1600 mg of tyrosine from 200-calorie serving of turkey. Chicken is also rich in tyrosine. Daily consumption of poultry can benefit the children as it provides them with essential and non-essential amino acids. These are needed for the proper growth of the muscles and for the functioning of organs. Poultry is versatile as it can be grilled, added to soups, baked and cooked in gravy. Spirulina is seaweed. It is a rich source of tyrosine and other nutrients needed for the body. About 200-calorie quantity of seaweed in its raw form contains more than 2010 mg of tyrosine. It is also low in cholesterol. Consuming it also provides you potassium, magnesium and pantothenic acid. If you consume the dried versions of seaweed, you will get 1800 kg of tyrosine from 200-calorie quantity. Soy products are one of the highest sources of tyrosine. Soy milk, tofu, soy nuts, soy sauce, tempeh, soy protein extracts, all are rich sources of tyrosine. Foods containing soy proteins can provide you about 2000 mg of tyrosine. Whole soybeans also contain high amounts dietary fibre and protein. Pumpkin seeds and sesame seeds are good sources of tyrosine. Have it roasted and salted, or add it to baked goods like cookies and cakes. Other seeds containing tyrosine in high amounts are Sunflower and chia seeds. 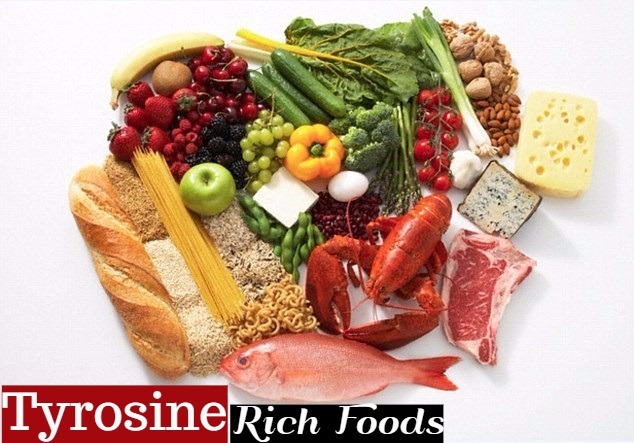 Now that you know about the foods rich in tyrosine, include these food items in your daily diet. A diet containing tyrosine helps in keeping you alert. It also helps in reducing stress. It is important that you have tyrosine rich foods, as critical brain chemicals are produced with the help of this amino acid.